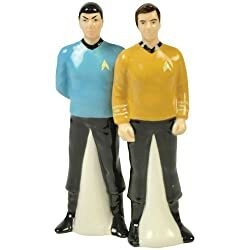 Westland Giftware Star Trek Magnetic Spock and Captain Kirk Salt and Pepper Shaker Set, 4-1/2-Inch After Brad got me this set, I realized that they were a bit TOO true to life. The Kirk shaker kept wandering off in search of "lady shakers," insisting his salt crystals were real dilithium. I'd have recommended this as a great Father's Day gift, but I noticed over time that the body of the shaker droops, and the uniform now seems, well, a bit snug. I also was disappointed to learn that the hair piece does NOT come off as expected. One star off my marks for that.